Genuine First Aid-Convenient First Aid Kit-25 Persons with Eye Wash & Cold Compress-Plastic. Ideal for facilities with 25 employees. 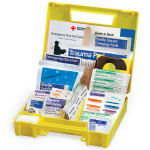 Industrial First Aid Kit for 25 persons with essential First Aid items per ANSI 2009 specifications. Contents are organized for fast access and labeled with clear directions by injury type. Contains concise directions for use. Refills available. (1) *First Aid Tape Roll, 1/2" x 2.5 yds..
(2) Roller Gauze Bandage, 2" x . (1) Roller Gauze Bandage, 3" x . (30) *Adhesive adhesive plastic bandage, 1" x 3"
(2) Elbowith Knee Adhesive adhesive plastic bandage, 2" x 3"
25 Person Premium First Aid Kit - Plastic - 9999-2110.